Through recent discoveries about brain functioning we can now explain how stress interrupts the normal functioning of the brain and increases impulsive behaviour. The pre-frontal cortex, the part of the brain right above our eyes, is responsible for our “higher thinking” – long-term planning, impulse control, deciding whether something is right or wrong. This part is sometimes referred to as the “CEO of the Brain’. The pre-frontal cortex is one of those aspects of the human brain that distinguishes between man and animal. When the brain functions normally, information comes in via the senses and is then sent to the pre-frontal cortex for processing and all decisions that are made are sent to the motor system, prompting the relevant muscles, etc. to respond. In the case of stress, this flow of information changes. Information no longer flows via the pre-frontal cortex, but flows directly from the senses to the relevant motor part. The brain is designed like this for a very good reason, for our survival. When we cross a street and a car is approaching rapidly, for example, we don’t want to create a situation in which we take our time to think about how we should respond. We should immediately, impulsively, jump out of the way. There is no time to think. The mechanism that disables the pre-frontal cortex when we are under stress, exists to protect us. However, this mechanism was not designed for situations of chronic stress. If people are continuously subjected to stress, then the pre-frontal cortex becomes increasingly disabled. This results in short-sighted thinking, impulsiveness. People start to behave like animals more than human beings. They can no longer see or judge the long term consequences of their actions. Transcending has the opposite effect of stress. It actually increases activity in the prefrontal cortex. Transcending is a situation in which the body enters into a deep state of rest, allowing the body to remove even our deepest tensions, and causing the frontal brain to become more active. This can be measured, for example via neural imaging scans which measure blood flow to the brain. The activity in the thalamus (related to bodily functions) reduces, indicating a state of relaxation, while activity in the frontal cortex increases. 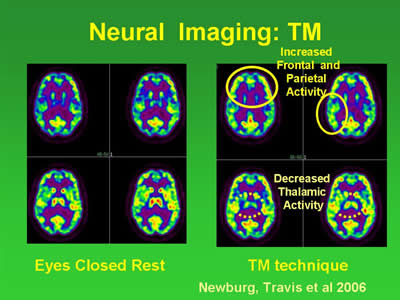 These changes in the brain turn out to be unique to the experience of transcending during TM. Ordinary relaxation, experienced with most other meditation or relaxation techniques do not (to the same extent) show these changes. Regular experience of transcending helps the brain functioning to restructure and behaviour to be less impulsive. This helps people to be increasingly and spontaneously aware of be able to see the long-term consequences of their actions and act accordingly.